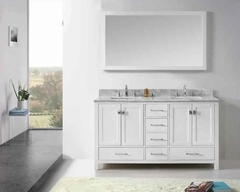 The Joyce collection has a transitional style with different elements making it unique while very stylish. The collection has everything you need to complete your bedroom. With clean straight lines there is a simple modern feel while each piece stands out with the varying wood grains drawing your eye in. The collection is constructed from select hardwoods and walnut veneers with English dovetail joinery and full extension drawer glides. Create a relaxing and peaceful environment in your bedroom with the Joyce collection. Keep your clothes organized with the simple and unique Dresser and Mirror Set. The Dresser features six deep drawers making it easy to separate clothing and accessories. The top two drawers are lined with felt ideal for jewelry. The Dresser makes quite a statement with the varying wood grain throughout drawing your eye in. 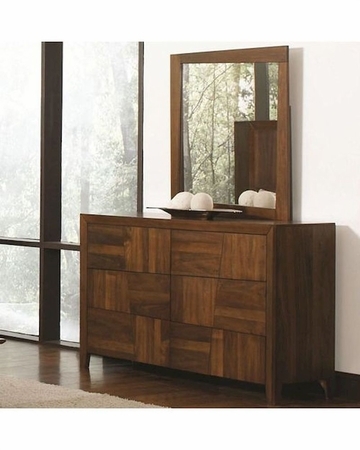 The unique mirror is rectangular in shape with angled pieces adding a twist to the traditional mirror.